Stock photo of the Cave and Basin Pool at the Basin National Historic Site In Sulphur Mountain, Banff National Park, Alberta, Canada. 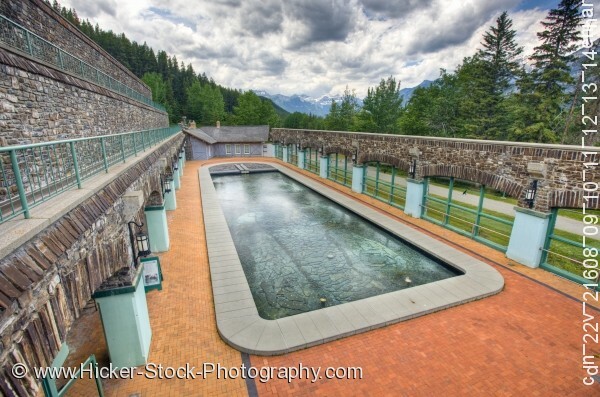 This stock photo shows the Cave and Basin Pool at the Basin National Historic Site In Sulphur Mountain. The pool is the main item in this photo. The pool is surrounded by gray concrete. The walk area that is around the pool are yellow and orange tile. A green metal pole fence supports a stone arched wall, surrounds the walkway and pool. Each post at the bottom of the arch has a black iron lantern. To the left of the photo are levels of walk areas, the base being a flat concrete surface and each level is built up with flat stones in colors of gray, brown and tan. The background shows a small blue building with a black roof. To the right past the metal fence is a cement walkway. In the background surrounding the area are many flourishing trees and mountain tops. The sky is a blue with dark and white puffy clouds.